Inspector Singh of the Singapore police is close to retirement age but having done something to annoy his superiors he’s the officer chosen to go to Malaysia to look after the interests of a Singaporean citizen in trouble. Former model Chelsea Liew has been arrested for the murder of her Malaysian ex-husband Alan Lee and Singh is meant to observe Malaysian police and ensure that she receives a fair deal. The problem for Singh is that everyone believes her guilty (and who would blame her given Lee’s years of abuse and the bitter custody battle they were in regarding their children) and if she is convicted she will receive the death penalty. As seems to be happening more and more with my crime fiction reading of late the mystery element takes a back seat to other aspects of this novel. In this instance it’s not a bad thing at all as there is so much else of interest going on, reminding me once again how suitable the conventions of crime fiction are for writers to explore a range of issues and ideas. Here Flint has included everything from relatively innocuous (though fascinating) observations about the differences between Singaporean and Malaysian cultures to tougher subjects such as the problems that can arise in Malaysia which operates under common law for most things but has formally adopted Sharia law to deal with family law matters for Muslims. 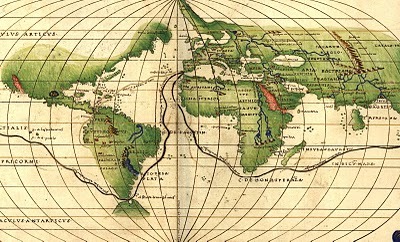 By using an example of a remotely possible case in this world of dual laws Flint has offered real food for thought and by resolving this thread in a somewhat unorthodox manner she offers no easy solution to the complexities that must inevitably arise in this type of scenario. Very realistic! It’s a powerful storyline and, for me, made more so because it plays out simply, without any proselytizing. Although tradition might demand the reader has some sympathy for the victim of a murder it is somewhat difficult here. Alan Lee appears not to have many redeeming qualities, being an abusive husband, horrible father, callous businessman and all around despicable human being. This does give Inspector Singh something to work with when he becomes convinced of Liew’s innocence and tries to convince the local authorities of it. As a character Singh is something of a stereotype being portly, smarter than average and a bit of a loner. He can be quite funny too, especially when dealing with his sister (who lives in Malaysia and provides her hospitality with opinionated homespun wisdom). Although we do meet two local investigators we don’t get to know them in much depth as, unlike most series of this type the Inspector will be off to another country in the next book so there’s not the impetus to develop ‘the investigative team’. Instead we spend time learning about the suspects, especially Alan Lee’s family. I really enjoyed this approach to storytelling. Aside from this excellent review at Crime Scraps most reviews I have seen of this book (and the series which now totals four) talk about it being light, fun and cosy and I think this is a little misleading. The crime at its heart does happen ‘off-stage’ so to speak and there are not extended passages of violent description so in that way the book is, I suppose, ‘cosy’ but I found the subjects it explored anything but light and frothy. In addition to the issues mentioned above it also deftly tackles the environmental impact of deforestation in the region and the treatment of local indigenous communities, neither of which are subjects I would consider light. Although now a proud stay-at-home mum in Singapore Shamini Flint has worked as a lawyer in both Singapore and Malaysia which provides an authentic feel to this book. Although it’s not first and foremost a legal thriller there are many scenes in which the law and its application is discussed and dissected in a thought provoking way. Amongst all of this we are treated to a solidly entertaining whodunnit as well, which kept this reader guessing to the end. Although I will happily read the next installment of this series in paper form I am really hoping that it will be released in audio format too as the narration of this book by Jonathan Keeble was (as always) excellent. 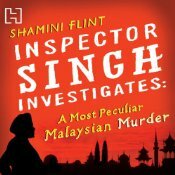 Inspector Singh Investigates: A Most Peculiar Malaysian Murder has been reviewed at Crime Scraps. This post is published at http://reactionstoreading.com if you are seeing it at another site then it has been stolen and/or used entirely without permission. This entry was posted in 2011 Global Reading Challenge, book review, Malaysia, Shamini Flint. Bookmark the permalink. I enjoyed this book, too, and was interested in the legal and environment issues the author discusses. The book sent me to do Internet searches about the customs, laws, Indigenous peoples and rainforest deforestation in Malaysia. So, I’d consider this a learning experience as well as a pleasant read. Shamini Flint, who exposes devastation to the rainforests here, said in an interview that she’s making up for her years as a corporate lawyer. I look forward to the next books in the series, and am eagerly checking at the library’s website. Bernadette, thanks for the mentions. I do sometimes wonder if some reviewers and “blurbers” have read the same book that I have, and it nice to read your excellent review [and Kathy’s comment] and confirm I was not mistaken. Bernadette – Excellent review as ever. This is definitely not a “typical” cosy if there is such a thing is it? It’s got some real depth to it and some “bite.” I agree with you, too, about the effect way in which Flint explores some of the larger issues but in a way that takes them down to the personal level. Your review puts mine to shame. I don’t remember for sure, but I believe I was one who simply wrote about it being light and fun, yet I was certainly aware of the difficult issues concerned. Mea culpa. I was particularly glad to see the emphasis on the deforestation of the area and the awful results of that predation. Thank you for such an enlightening review. I read/reviewed this book back in 2009: http://petronatwo.wordpress.com/2009/06/08/inspector-singh-investigates-a-most-peculiar-malaysian-murder/ , and I agreed then with your current take that it is not anything like as light and superficial as conveyed by the cover, lettering design and blurb. Something strange seems to have happened to my google searching in past few weeks as your review didn’t show up where once it would have. I obviously read the review at the time but I am not surprised I don’t remember – I can barely recall what I did last Thursday. Thanks for this excellent review, Bernadette. AMPMM has gone straight on my TBR pile, as I’m trying to broaden my ‘transnational’ reading beyond the usual national suspects (mainly Scandinavia and Europe). I’m reading an Indian crime novel at the moment, which seems to be using the crime narrative as a means of providing a satirical portrait of Indian society (Vikas Swarup’s Six Suspects), and am enjoying that different national perspective very much.